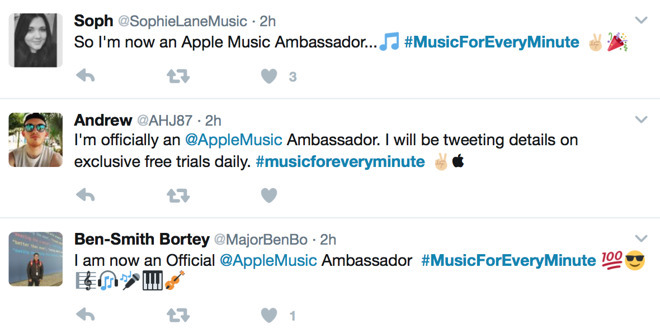 Starting Thursday afternoon, the #MusicForEveryMinute hashtag went live on Twitter, with individuals announcing to the world that they are now officially Apple Music ambassadors. Apple has been engaging with members of the program via automated text messages, pledging to provide an extra three free months to the service once the campaign ends in April. Initial posts of the hashtag all appear to be from the U.K., suggesting that the promotion might emanate from England. As of Thursday afternoon, #MusicEveryMinute began trending on Twitter in the U.K.
As part of the promotion, Apple has asked participants to link to Apple Music, with a graphic advertising a free three-month subscription for all university students. 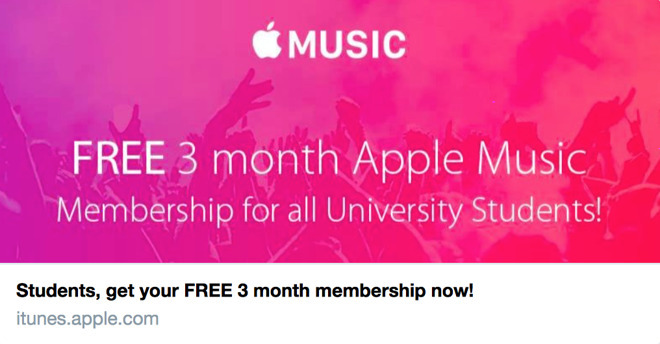 Though the ad targets students, Apple Music is free to try for the first three months for any first-time subscriber. Participants have advertised that they will be tweeting details on exclusive free trials throughout the length of the campaign. Apple Music has some 20 million subscribers, with most if not all of them paid. Unlike competitors such as Spotify, Apple Music does not offer a free listening beyond the initial three-month trial. In the U.S., Apple Music subscriptions are available for $9.99 per month for an individual, with family plans priced at $14.99 per month. Student pricing is available at a discount, for just $4.99 per month.